I can sort of try it on, and I think it might just fit. I lengthened the body about an inch, so it should be long enough. 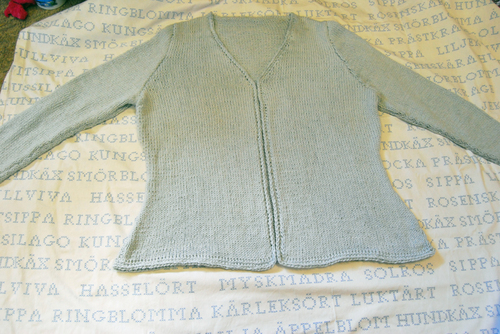 I never mentioned that the last sweater I finished was a little too big, and the yarn was so bulky it just wasn't flattering, so I haven't had a lot of confidence in my sweater knitting abilities. I'm feeling better about it now, and I think I'll unravel that other one and make something else that will be flattering. 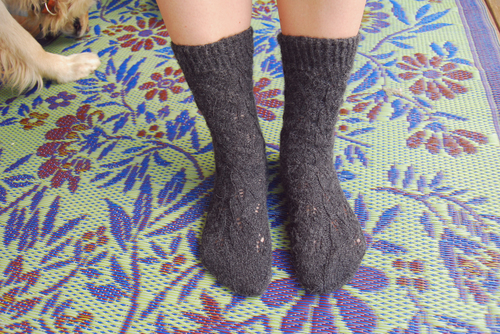 There are a lot of sweaters that I want to knit, but I also love socks, and I have much better luck there, so it's hard not to just keep knitting socks. Also, I came across this picture on flickr the other day, and decided that I want my sock drawer to look like that someday. I really like Debbie Bliss yarns and patterns, and now a whole magazine full? I want to make a few things in here. That wrap on the cover is pretty, and I think it would be a good mindless knitting project, since it's mostly stockinette. I totally missed the premier issue, this is the second one. Obviously I need to read more knitting blogs. There's not a whole lot to see yet, but how about that green linen? I like it! I also am planning on doing that mushroom tutorial this weekend, if I can manage to pick up some more clay. I'll do my best to get it up here by Sunday night. Don't forget to leave a comment on this post if you want to have a chance to win a set of three mushrooms! I finished another project this week, and I have to admit, the results are not quite as good as I hoped. So I thought I'd share what I learned to help me remember not to make the same mistakes again, and maybe save someone else from the same errors. I have some big, square feather pillows from Ikea that needed covering, so I had an idea to do some big appliqué flowers. 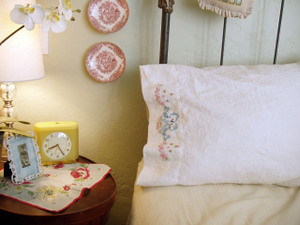 I used a heavy linen for the cover, and quilter's cotton for the flowers. 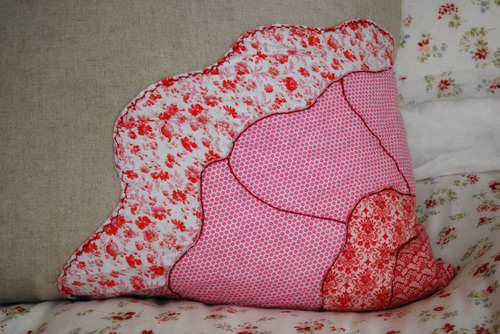 When I finished stitching up my cover, I put it on the pillow, and it was okay, but seemed a little stiff. I also think I could have made the flowers a little bigger. So I thought I'd try washing it, to soften it up a little, but it turns out the linen I used shrank more lengthwise than widthwise. 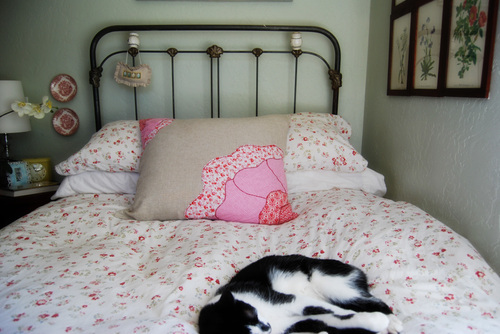 So now my pillow is more of a rectangle. The flowers bunched up a little too. 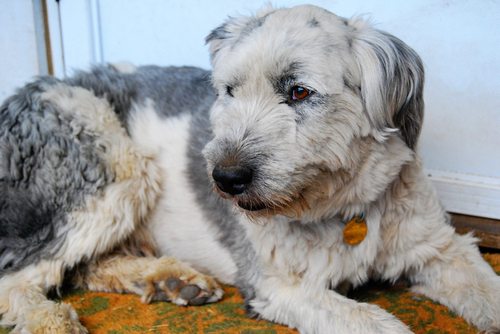 Petey, however, is indifferent to the pillow. Also, perhaps I should not write boring blog posts while still grumpy from allergies and while watching Raising the Bar which I Tivo'd last week. I can't get past the bad haircut to decide if the show is any good. I don't think I will be getting a season pass to this one. Well, it is now confirmed. I have some very smart blog readers. Thanks to everyone for telling me about the swallows. Since they eat flying insects, I'm going to let them stay. Eggs have most likely already been laid, and I don't want to disturb them. Once they leave, I'll probably knock down the nests, because they are right above the door to our shed, and stuff is dropping, and by stuff, I think you know what I mean. That wouldn't be a huge problem, after all, I dodge chicken poop all day long since our chickens are spoiled and get to free range around the entire yard, but this is over a door I walk through several times a day, and I don't want to be pooped on. Also, it's still kind of creepy when they come pouring out of their nests and circle around and around above me. Silly birds, I was here first, and if I bug you so much, maybe you shouldn't have built you little swallow colony above a door I go through several times a day. Doh! Also, there is a lot more bird poop on my car, and I think we all know who to blame that on as well. Let's change the subject, shall we? Sheesh, it was hot this weekend, well over a hundred on Saturday, and today a much cooler 98 or so. One good thing about summer, at least, is all the delicious fruit. So I made a lovely, cool fruit salad. 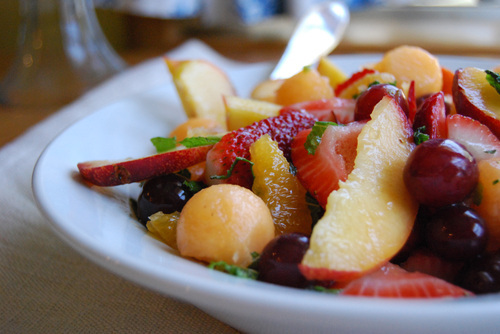 This is a great recipe, because it works with whatever fruit you have on hand. I've made it with all sorts of different combinations and it's always delicious. The only things you really have to have are oranges and fresh mint. Today's version had strawberries, red grapes, nectarines, and a french-kiss melon that I got at Trader Joe's. It looks like a small cantaloupe, and it was so sweet and delicious. So here's my fruit salad secret: cut the peel off an orange, so there's no white pith-y stuff left, and hold it over your fruit salad bowl while slicing out each section, again, leaving the white membrane in between the sections behind. Once all the sections are cut, squeeze all the juice out of what's left of your orange. Then chop up some fresh mint and toss everything gently. It's just perfect. I'll be eating lot's of variations on this theme all summer long. I managed to get a couple more curtains done, but my sewing room is our little guest house, which has no air conditioning, so I didn't make as much progress as I had hoped. Instead, I decided to start on something cool and cute to wear. 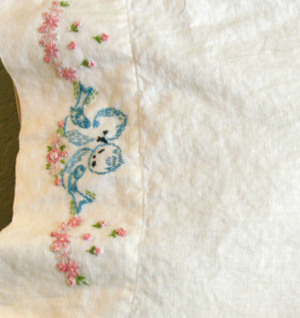 Inspired by this smock/dress from Noa Noa (and really everything on their site is so pretty and inspiring), I got some white cotton/linen on sale at JoAnn and this pattern (view D), and thought I'd add a little embroidery to the front band, and make it wider. 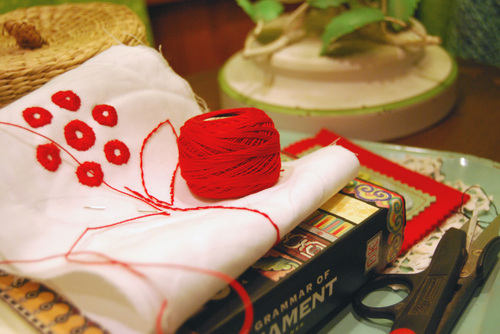 So I sat in the cool, air conditioned house, and did a little stitching with red perle cotton. I think I'll be doing a lot more of these. For those who were asking last time I posted about this little project, I washed it, and I don't see any of the markings at all, they seemed to have come out quite nicely. The transfer was dark grey, and you could definitely still see it through the pale pink flowers before washing, but not now! Two thumbs up for Patternbee! 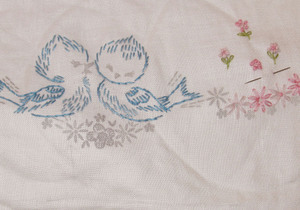 Floresita has a great site for free vintage embroidery patterns, including these little birds (thanks to the commentors for that info! 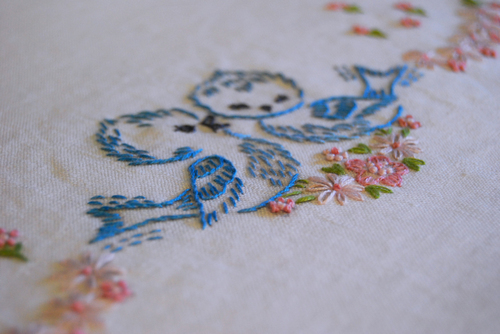 ), as well, but you have to print them out and trace them onto your fabric. I'm too impatient to do that for something this detailed, so I really like the iron-on versions, but I may print up some simpler designs and try it out. I actually have no time for this at all, I have some Christmas gifts to work on, but still, I'm sneaking a few minutes here and there to work a couple of rows. 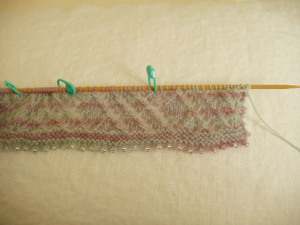 This is the Hanami Stole, from Pink Lemon Twist. I love the beaded cast-on, even though it takes ages longer than any regular cast on. The yarn is from yarnchef, who I cannot recommend highly enough. This colorway is called flourite, and it's really beautiful. Katy even included the prettiest little stitch marker that matches the yarn. Sadly, my camera didn't want to take any good macros this morning, so you'll just have to believe me. It puts my green plastic Clover markers to shame. This is my first real lace project, not including the embossed leaves socks or the Misty Garden scarf I've made. Those were just small potatoes compared to this. It's taken me awhile to figure it out, and there may have been a little spat when I was trying to carefully keep count of my stitches, and somebody, who shall remain nameless, walked into the room and started talking to me. The nerve! He completely threw me off and I gave up and started over. 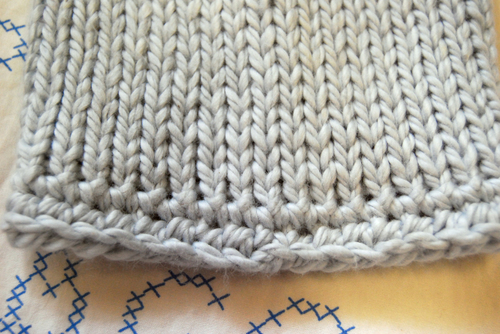 I had to unpicked a few rows again a little later (I only had myself to blame that time), and there's still a little mistake, but I can live with it. Now that I'm a few rows in, I'm getting how the lace pattern works, and there shouldn't be anymore problems. I hope not, because this stuff is not fun to un-knit! The bathroom is nearly complete. I'm sure everyone around me will be pleased when it's over, so they don't have to hear any more about it. This week I managed to install the light fixture, which replaces a Home Depot $6 fixture put there by the previous owners. 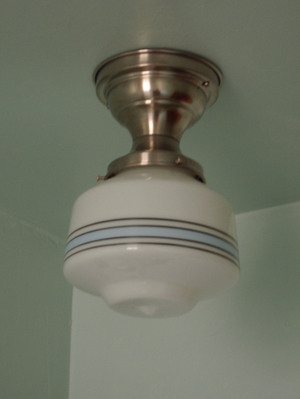 If you're wondering how good a $6 fixture could possibly look, I would have to answer, "not very good." I had a before picture on my camera, but I guess the fixture was so bad that the camera decided the memory card should be re-formatted so no one would have to see it. The new one, from Schoolhouse Electric, is much, much better. I can't recommend them enough. They were great to do business with, and I love that they let you pick out the fixture and then pick the shade. That way you end up with a really custom, one-of-a-kind light. I thought the prices were really reasonable too, considering the care that goes into all their products. I think they have an interesting story. 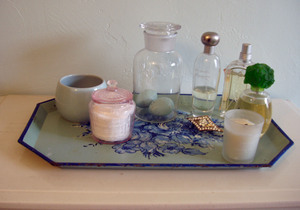 Our bathroom isn't a super fancy master suite spa sort of thing, but it feels so luxurious now. I may still look for a shower door, but I hung a tension rod and curtain, and it's actually working out okay. There's so much room now when I shower. Before, there was alway a shower curtain touching something or other, an elbow or a shoulder, but now I can practically put my arms all the way out before I hit a wall or curtain. And no more doing the limbo to wash my hair. The shower head is way, way above my head. Then, of course, there is the hot, bubbly baths I've been taking! Heaven! I've still got baseboards to install, a couple towel bars to hang, and paint to touch-up, but when it's done you better believe I'll be showing the whole thing off right here!